A massive demonstration for the ouster of SB Shashank was held on Tuesday in Aizawl where over 50,000 YMA volunteers gheraoed his office. 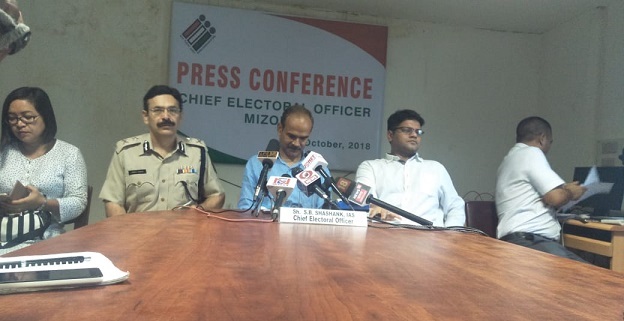 Mizoram chief electoral officer SB Shashank told Northeast Now that he would not leave his post until he receives orders from the Election Commission of India. SB Shashank has been blamed by the entire people of Mizoram as the main reason why Lalnunmawia Chuaungo was relieved from his post by the ministry of home affairs before Mizoram elections slated for Nov 28. Talking to Northeast Now SB Shashank said that he would not leave Mizoram until his post as the CEO of the state is relieved by the Election Commission of India. “I believe there have been a lot of talks between the ECI members and the civil society organisations of Mizoram. I am a government of India servant and until I am relieved of my duties as the chief electoral officer of Mizoram by appellate authority I do not have the right to quit or leave my posting,” SB Shashank said. SB Shashank is being alleged by the Mizo civil societies as the reason for the ouster of Chuaungo after he filed a complaint against him charging him of involving in election matters of Mizoram. He is also being accused of conspiring with the BJP to work out voting opportunities to the Brus settling in Tripura by setting up polling stations at the Bru relief camps in Tripura. The Bru refugees who have been settling in Tripura for the past two decades are reportedly unwilling to come back to Mizoram after nine attempts of repatriation.